Add a 4-port SuperSpeed USB 3.0 Hub to the 3.5" front bay opening of a computer case. 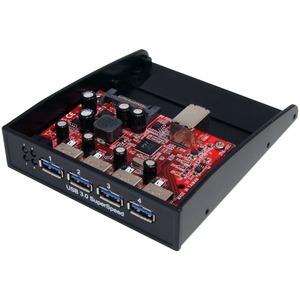 The 35BAYUSB3S4 3.5-inch Front Bay to 4-Port USB 3.0 Panel Hub turns any available 3.5-inch computer case front bay into a 4-Port USB 3.0 hub.Using only a single USB connection, this front panel hub adds four easily accessible USB ports to the front of your computer case through a 3.5-inch bay, or through a 5.25-inch bay using the optional Front Bay Bracket Adapter (BRACKETFDBK) accessory. Each of the added ports is compliant with the USB 3.0 standard which supports up to 5 Gbps of bandwidth (10x faster than the USB 2.0 standard) and up to 900mA of power.Accessorize with the PEXUSB3S11 PCI Express card to provide an internal USB 3.0 port, so as to keep the external ports free for external devices. Backed by a StarTech.com 2-year warranty and free lifetime technical support.